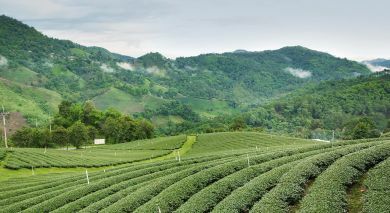 With the Kanchenjunga, spectacularly green tea estates and tropical green forests for neighbors, it is no surprise that the Glenburn Tea Estate in Glenburn has been selected as one of the 101 best Hotels of the World, by the Tatler travel Guide for 2006. This 1,600 acre estate is a birding, adventurers and trekking enthusiast’s delight and the most popular activity is of course the Tea Tour around the estate and tea factory. It is an all inclusive hotel and included in the price are all meals – including picnics/barbeques, refreshments throughout the day, complimentary tea, coffee, mineral water, fresh juice and soft drinks, all laundry services, personal tours of the tea estate and factory, and a tea tasting session, optional overnight stay at Camp Glenburn Log Cabin on river bank, nature walks and birding through private forest areas along river fronts, followed by picnic lunches, day trips to Darjeeling Town and Kalimpong and fishing on River Rungeet (seasonal), etc. Fantastic room, food, service and guides. The only thing that could possibly be improved is the access road to the property. Brilliant wish we had more time there.